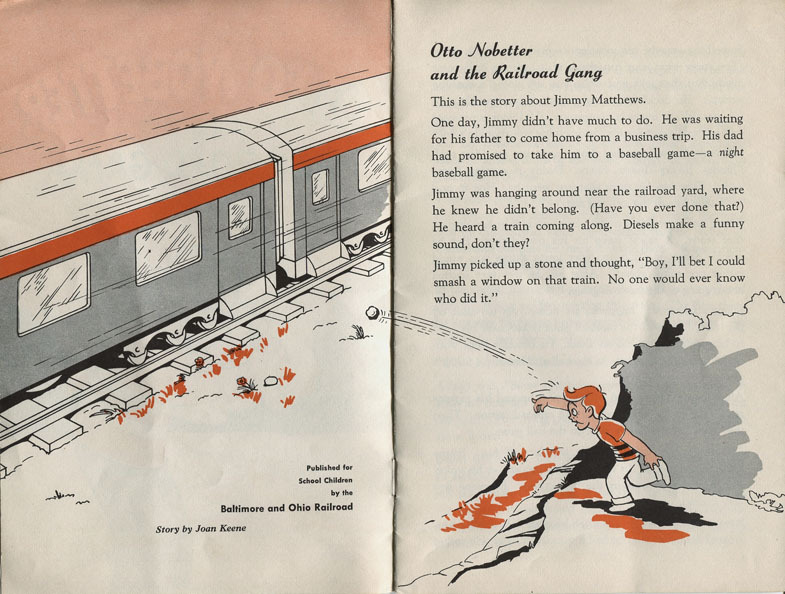 Today we rediscover Ted Eshbaugh’s missing 1957 cartoon through THE “OTTO NOBETTER AND THE RAILROAD GANG” SAFETY BOOK. For the fans of Ted Eshbaugh, the past decade has been extremely exciting as much of his legacy has been rediscovered. Several sought after color films such as The Snowman (1933), The Wizard Of Oz (1933) and a few others have been rediscovered and made available (thank you, Steve Stanchfield) in ways that would certainly put a smile on Mr. Eshbaugh. Despite these celebrated rediscoveries though, there is a lot of material that is sadly still unaccounted for. A black and white trade photo, from the 1953 No. 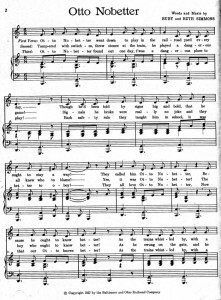 1 Vol. 14 issue of Business Screen Magazine for “The Happy Locomotive” color filmstrip. Filmstrips were long pieces of 35mm film, ranging from a few feet to a yard or two in length and were composed of individual pictures. They were frequently used as educational aides in schools, factories, military institutions, etc. for teaching and demonstrating concepts and ideas. Soundtracks for these films were issued on vinyl records. One particular film that’s missing, but probably does exists, is a 1957 animated cartoon entitled Otto Nobetter And The Railroad Gang. This Eshbaugh film was a 16mm film that was made in Eastman Color and was commissioned by the Baltimore and Ohio Railroad Company. 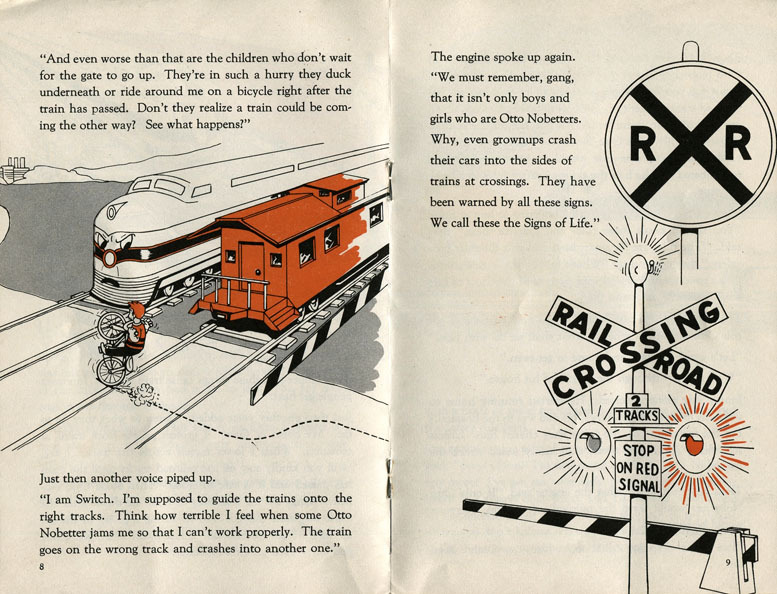 It was designed with the intent of preaching Railroad safety to children, and was exhibited in elementary schools and on television stations in communities where B&O operated; it was not exhibited outside of B&O’s territory. 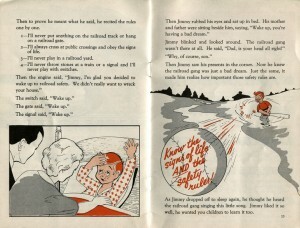 Though missing today, one existing piece of ephemera pertaining to the film is a fifteen page souvenir safety booklet that was created to accompany the cartoon. 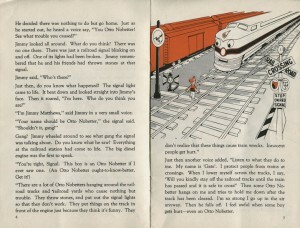 While not the cartoon itself, the booklet does allow Eshbaugh fans to get a sense of what the cartoon was, as it features the “Otto Nobetter” story, eight illustrations (which appear to be Eshbaugh’s work) depicting scenes from the film, and the words and notes to the “Otto Nobetter” safety song. 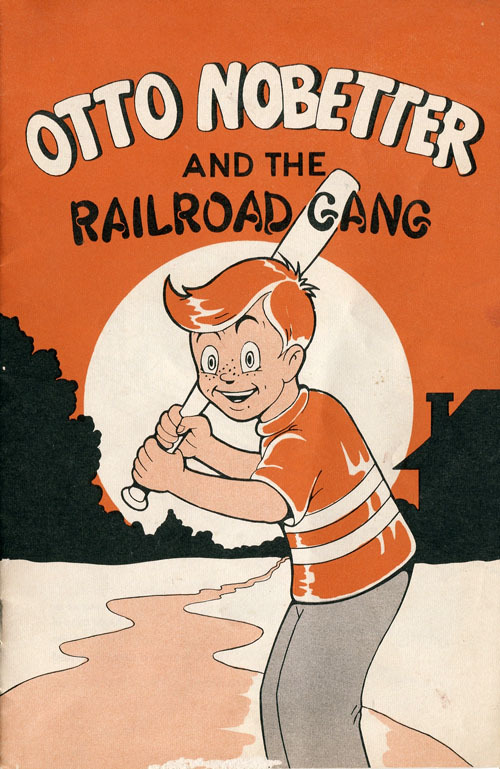 “Otto Nobetter and The Railroad Gang” was created to update a successful award winning filmstrip program commissioned by B&O in the early 1950s, that addressed the issue of children playing in railroad yards. 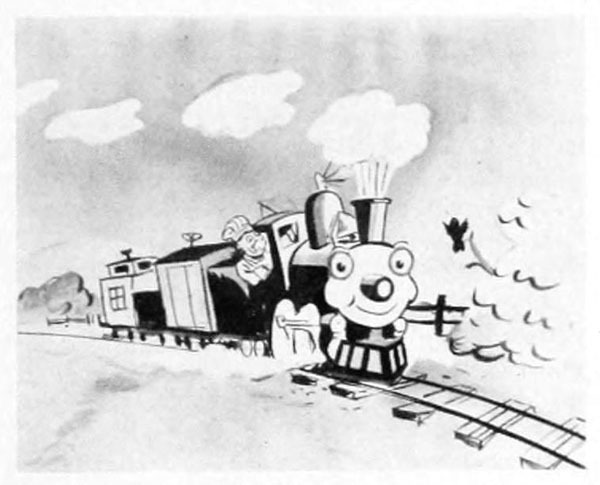 This first film program consisted of two 35mm sound and color filmstrips composed of cartoon drawings, the first being “The Happy Locomotive” from 1951 and it’s 1953 sequel “A Close Call For Jimmy”; Both filmstrips were produced by the Stephen Fitzgerald Company and Unifilms Company. B&O would issue the filmstrips to fifteen different B&O policemen who would travel to Elementary schools in communities where B&O operated in and exhibit the films to classes. 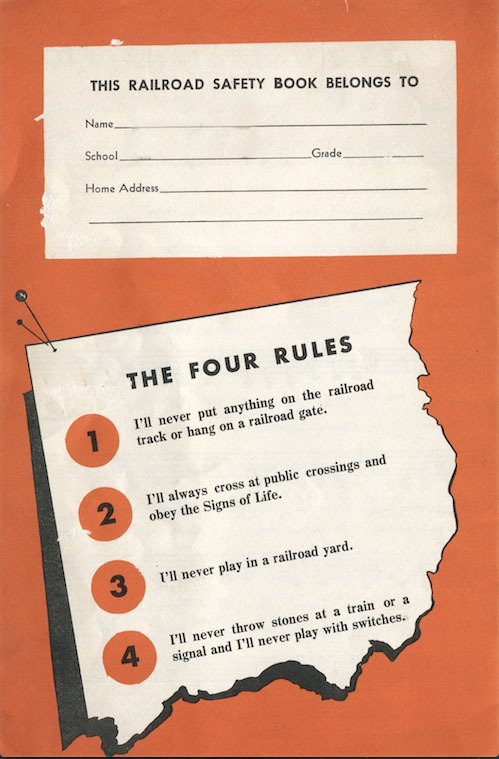 Children in attendance at the presentations would also be issued a souvenir safety booklet, from the policeman, to help further emphasize railroad safety. 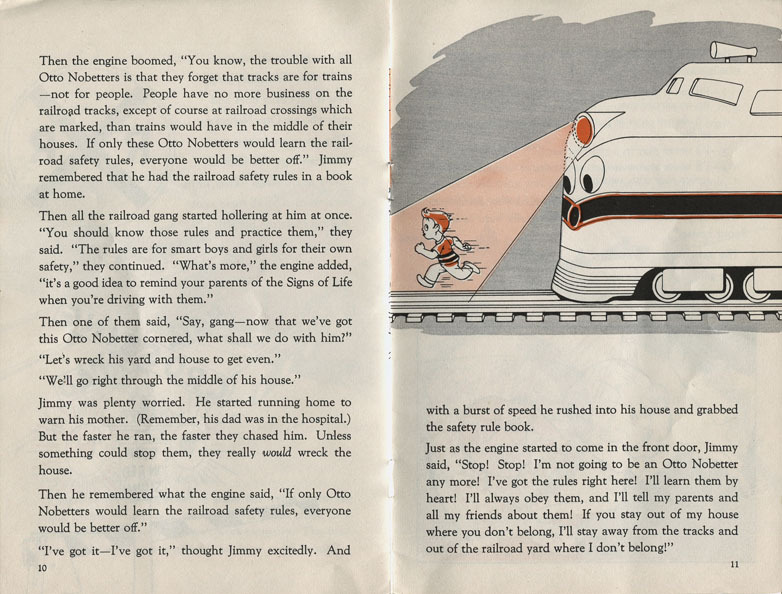 Trade magazines such as Business Screen Magazine, and local press credited this program for reducing the number of children venturing into rail yards and onto train tracks by 75%. 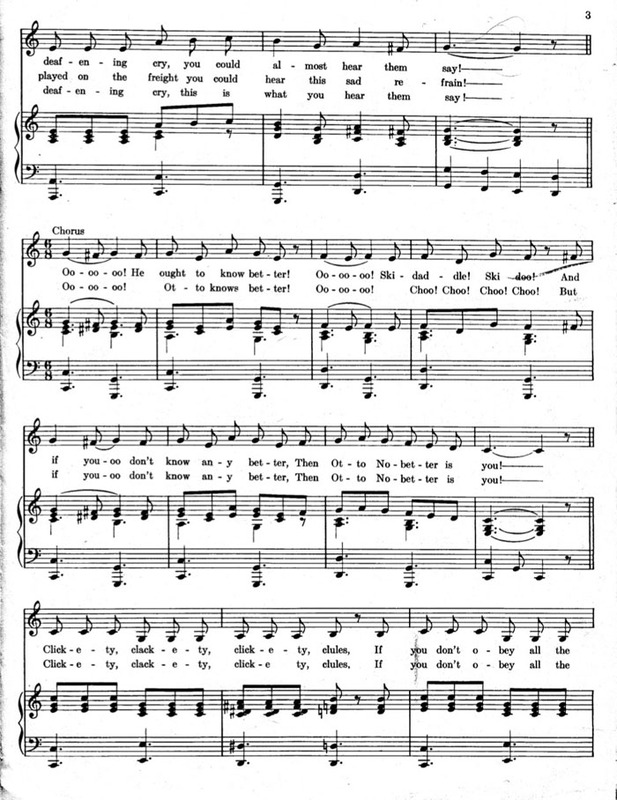 The Sheet Music to Otto Nobetter. 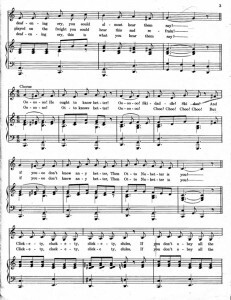 This was issued to schools for later class or all school sing-a-longs. Notice how, unlike the souvenir booklet, the Ted Eshbaugh Studios has a credit on the cover. 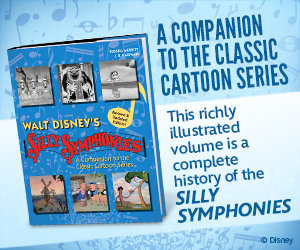 By the mid 1950s, the success of the filmstrip program prompted B&O to update it, this time with an animated cartoon and also with a song that children could memorize and sing. 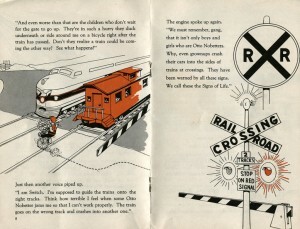 The end result was Otto Nobetter And The Railroad Gang: a story written by Jan Keene, a song written by Ruth and Ruby Simmons, and a fifteen minute animated film adaption of the story and song made by Ted Eshbaugh. 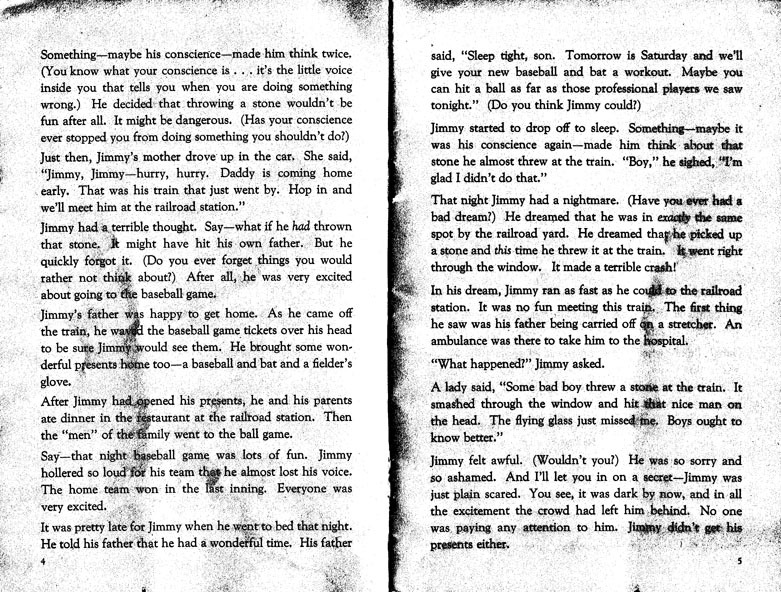 The story (which can be read entirely in the book below) revolves around the nightmare a mischievous young man named Jimmy Matthews has one night in which he encounters the ‘Railroad Gang’; consisting of an angry diesel locomotive, a signal (whom Jimmy and his friends had vandalized earlier) and a switch. 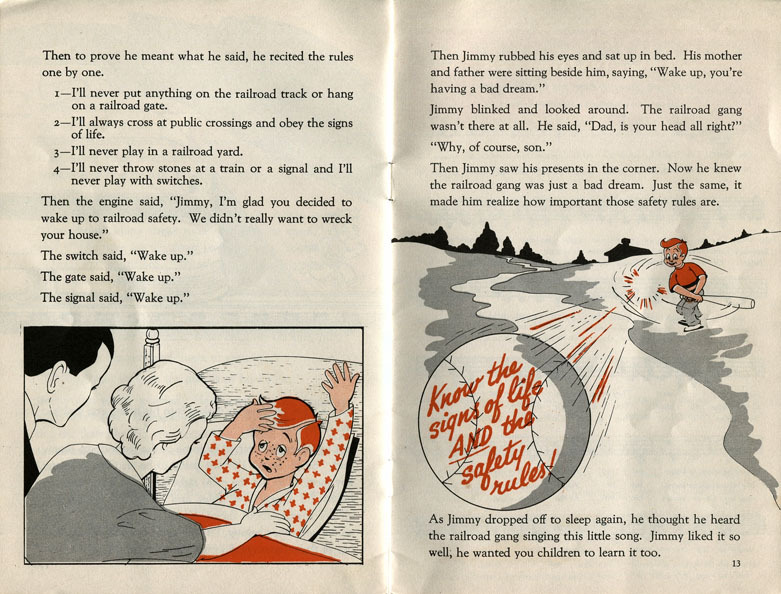 Having had enough of Jimmy’s vandalistic antics towards railroad property, the gang starts singing about how he’s an “Otto Nobetter”, and then threatens to destroy his house! 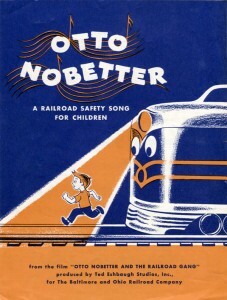 The whole concept of the story and film was designed to preach the ‘four rules’ (see the back of the booklet below) revolving around railroad safety to children, and also to introduce the ‘Otto Nobetter’ Safety Song. While Ted Eshbaugh was certainly responsible for the motion picture, it’s not quite known to what extent his involvement with the creation of the ‘Otto Nobetter’ Program was. Around the time of the film’s production Mr. Eshbaugh was operating Ted Eshbaugh Studios, a small production company in New York City that made industrial films, television commercials and freelance animated cartoons. 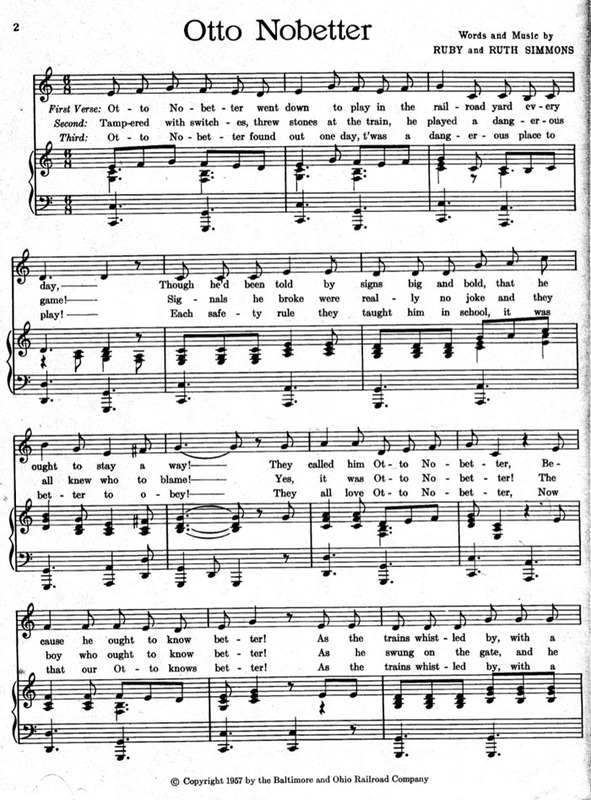 It is very well possible that B&O hired Ted Eshbaugh to create the entire program from scratch, and thus it was Eshbaugh who hired Joan Keene to write the story and Ruby & Ruth Simmons to create the song for the production. 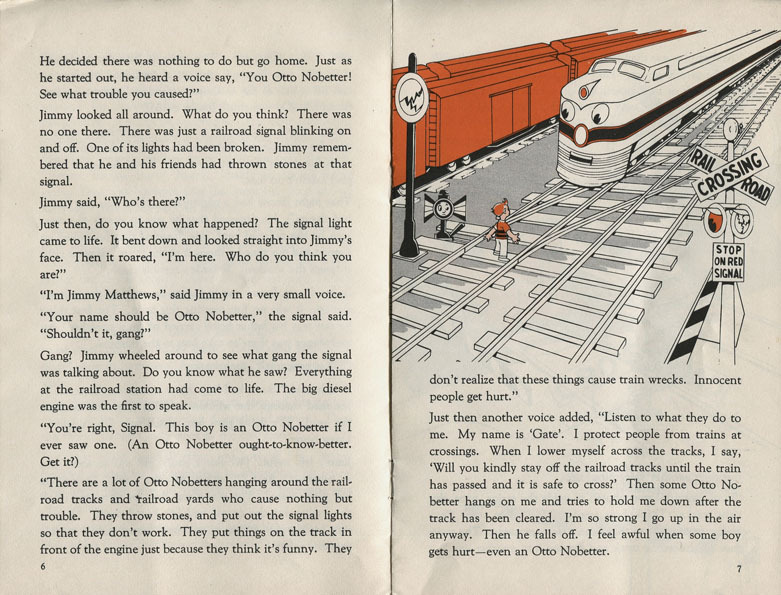 However it is also possible that Ted Eshbaugh, Ruby and Ruth Simmons, and Joan Keene were all individually hired at different times by B&O to work on ‘Otto Nobetter’ in parts. Exhibition of ‘Otto Nobetter’ was carried out in the same means as it’s “Happy Locomotive” predecessor, with a few additions. 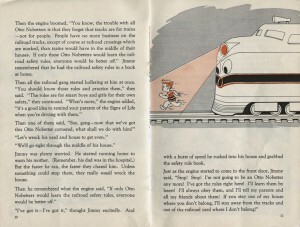 Like before, several different B&O policeman were issued the cartoon and would show it to children in elementary schools. 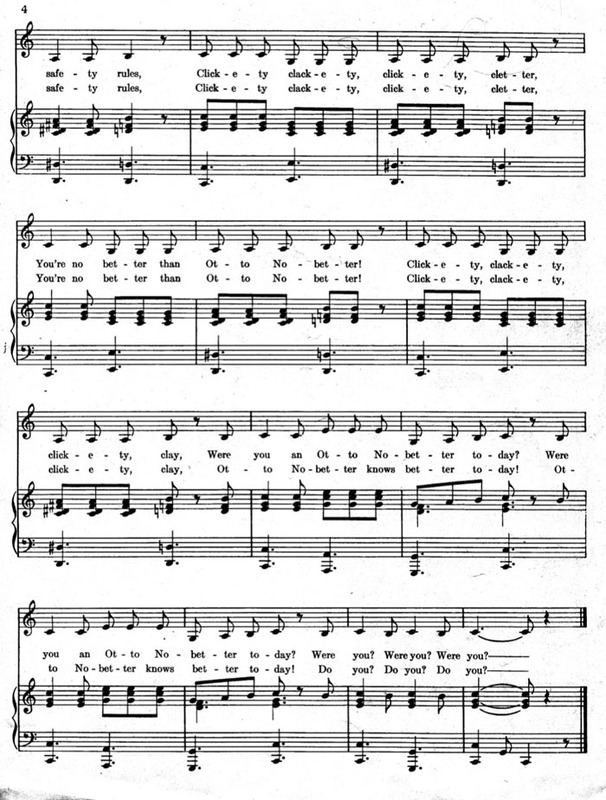 School exhibitions, as indicated by trade magazines and press, were done in individual classrooms or at school assemblies, and consisted of showing the cartoon and also showcasing the ‘Otto Nobetter Song’; It’s hinted that the song had it’s own sing-a-long aside from the cartoon as part of the screening. 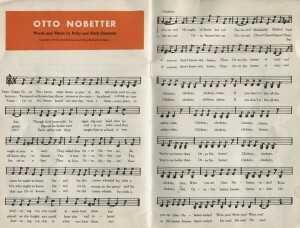 B&O policeman would issue the ‘Otto Nobetter’ booklet to children as a souvenir to help emphasize the film’s message. 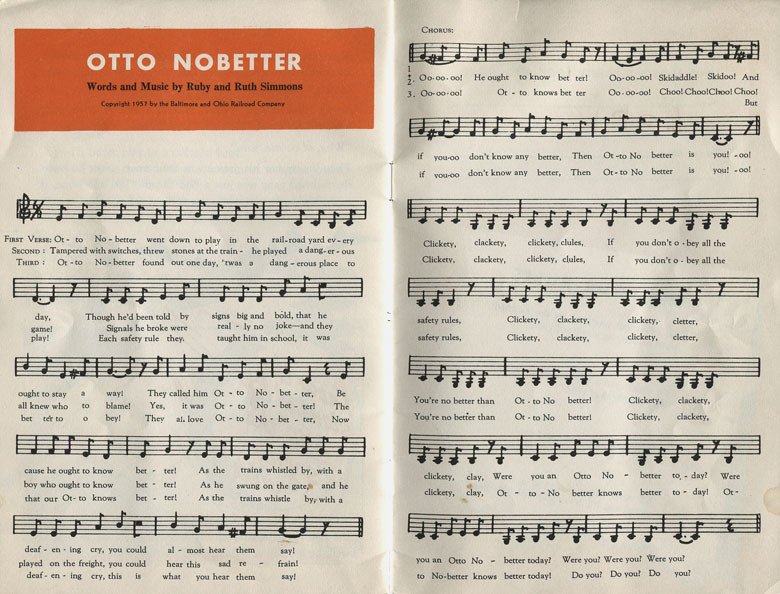 The policemen would also issue ‘Otto Nobetter’ sheet music and a 45rpm recording of the song to schools for future use; the cartoon itself was not issued to schools. 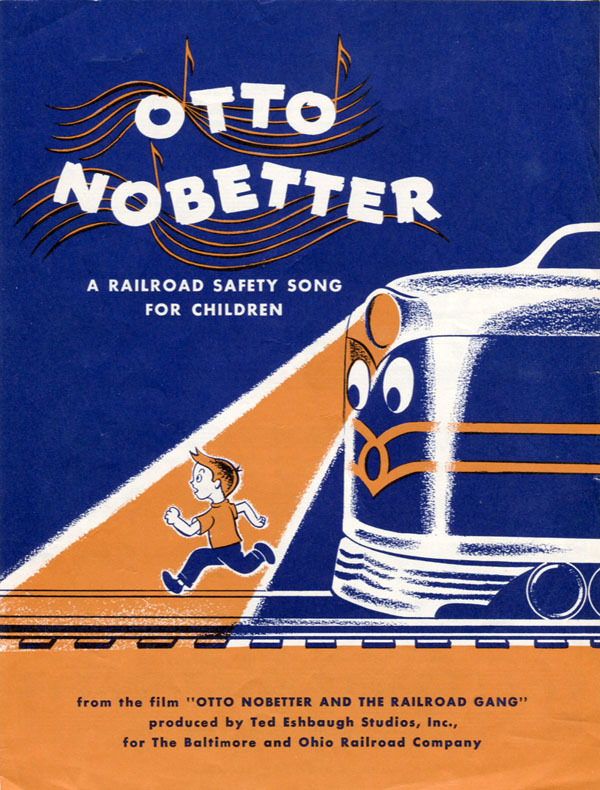 Along with distributing the film for exhibition in schools, B&O would also distribute the cartoon to local television stations for broadcast during children’s shows; probably in a means in which the TV program spotlighted the ‘Otto Nobetter’ song. In terms of how these drawings compare to the actual film itself is a bit difficult to say. Virtually all of Mr. Eshbaugh’s work from the 1950s is extremely rare or missing, making it difficult to explore the production value of his films during this era. While the illustrations look promising that the film was composed of beautifully crafted animation, depending on the budget that was available from B&O, it’s difficult to say if it was as lively as Eshbaugh’s work from the 1930s or just composed of very limited animation. Until a print becomes available we’ll just have to use our imagination as to what may have been. 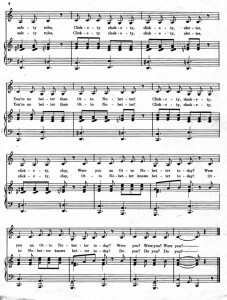 PS- Here is the sheet music to the ‘Otto Nobetter Song’ for you to sing when you are at a railroad crossing or unintentionally wonder into a railroad yard. This way you’ll avoid an unpleasant encounter with the Railroad Gang vandalizing your house…. 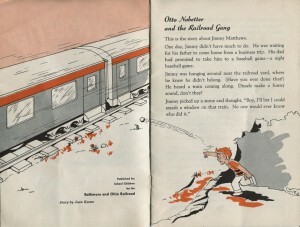 A film review for “Otto Nobetter And The Railroad Gang” from the 1958 No. 2 Vol. 19 issue of Business Screen Magazine. Yes, I do remember filmstrips, and how many of them had soundtracks on LPs (and cassettes in the ’70s). 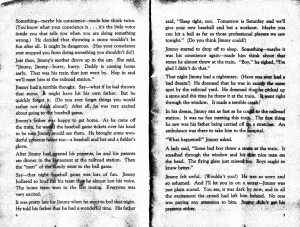 The soundtracks would have signals to tell the teacher (or whoever was appointed the projectionist) when to move the filmstrip to the next frame. Some filmstrip projectors had turntables (or cassette players) added on, and they would automatically advance the filmstrip if the recording had special tones. The bulk of filmstrips I recall were produced by the Society for Visual Education (svemedia.com). Almost every railroad had financial difficulties in the ’50s and ’60s due to the decrease in passenger train travel. B&O and C&O would become the “Chessie System” and years later merged with the Seaboard System to become CSX. What an interesting film topic! Even if the film was found, I’d doubt it would be in very good condition (as it was filmed in Eastmancolor, which I hear fades very easily to a deep red or purple). Who knows? It’s very possible that it could turn up at an antique shop or online at any moment. 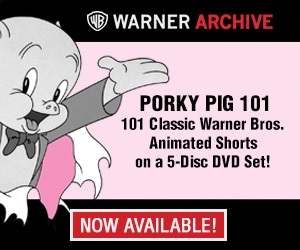 I have little knowledge on advertising cartoons other than war propoganda, but by what I read above it seems like the company did a good job making the film. Do the vinyl records still survive? Jonathan A. Boschen is a professional videographer and video editor, who is also a film and theatre historian. His research deals with pre-1970s movie theaters in New England and also film history pertaining to the Jam Handy Organization, Frank Goldman, Ted Eshbaugh, Jerry Fairbanks, and industrial films. (He is a huge fan of industrial animated cartoons!). Currently, Boschen is working on a documentary on the iconic Jam Handy Organization.